We offer Marine Insurance Service which are specially designed to meet the diverse insurance requirements of the people. This plan guarantees maximum protection at low premium rate. We are providing Marine Insurance Services to our clients. We do interact with our clients and in accordance with their requirements, execute these services. In addition to this, our range of these services are highly treasured by our clients. We leave no stone unturned in handling your cargo with the utmost care. But, there is always a small risk of certain unforeseen events, and for these, we make sure you are well-protected. Includes arrangements of Insurance cover for all import and export shipments on warehouse to warehouse basis. Also includes liaison with principal underwriters for claim settlement. Our company has mastered the art in providing Marine Insurance Service to the clients. 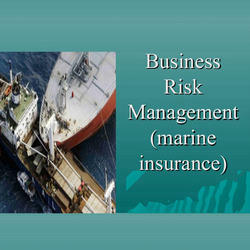 Marine Insurance Service is rendered by experienced professionals, who have associated with this field for many years. Provided service is broadly acclaimed in the market for timely delivery with assured result by respected clients. Our Marine Insurance Services is highly known among customers for our effectiveness and flexibility. Provided service is completed by our skilled employees at prescribed time. Our insurance service is broadly applied in commercial industry. We can offer comprehensive cargo insurance coverage at exceptionally competitive rates suited to your needs. All goods are insured from Warehouse to Warehouse (not from Port to Port). We cover the following Institute Cargo Clause. We are offering Marine Insurance services to our clients.